TAZO Organic Peachy Green TeaIt’s been my experience that all TAZO teas are delicious and the TAZO Organic Peachy Green Tea is certainly no exception. I buy at least three boxes of TAZO tea each time I go to Target (great selection). If I’m out – or even remotely low – on their Wild Sweet Orange or Passion, I’ll buy those. If I see a new flavor, as long as it isn’t mango (deathly allergic), I’ll also grab a box of it. This is all, of course, on top of the TAZO Chai Tea Concentrate I can’t possibly live without. 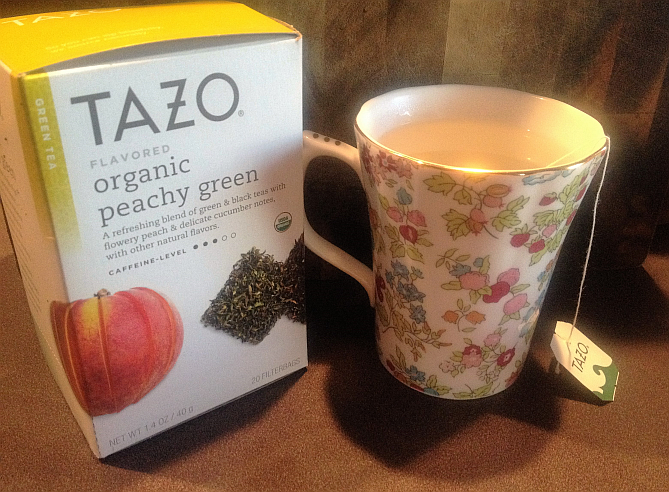 After loading up on the “regulars” last week, I grabbed a box of the TAZO Organic Peachy Green Tea to try. It wasn’t the first time I’d seen it, to be honest. It had been tempting me for quite a while. The problem is, though, I’ve been jilted by so many “peach” flavored teas that… well… I’m having to learn to trust again. TAZO Organic Peachy Green is Great Hot and IcedSince TAZO is one of the names I trust the most, I actually accepted its invitation this time and brought it home with me. Somehow, between leaving Target and getting home with my tea stash, my hopes began to soar so high that the first thing I did was make a cup. It was phenomenal and, honestly, made me forget every peach flavored tea that’d ever broken my heart before. Peach is one of my favorite flavors in the world, so it frustrates me when teas don’t do right by it. Nine times out of ten, the flavor they call “peach” isn’t even close to the peach I know and love. With TAZO Organic Peachy Green Tea, however, I literally knew it was going to be special the second I opened the tea bag. My nose knew even before my taste buds. The flavor is 110 percent peach… not just a flavor that’s in the neighborhood. What’s more, TAZO did a perfect job of distributing just the right amount. It doesn’t taste like you’re drinking a peach – it tastes like you’re drinking a great cup of green tea that happens to have peach on its mind. Trust me, it’s a beautiful thing. This tea is also fantastic iced. A clear indication in my house of how much I love a tea is how fast the box disappears. 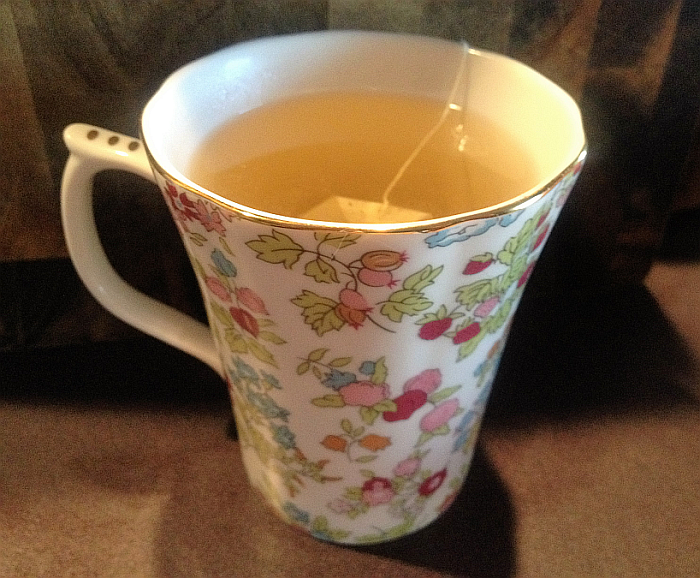 TAZO Organic Peachy Green Tea has become an “instant legend” in our home – the box was completely empty within 4 days. Do you have any idea how many cups and glasses of tea that is?!?! 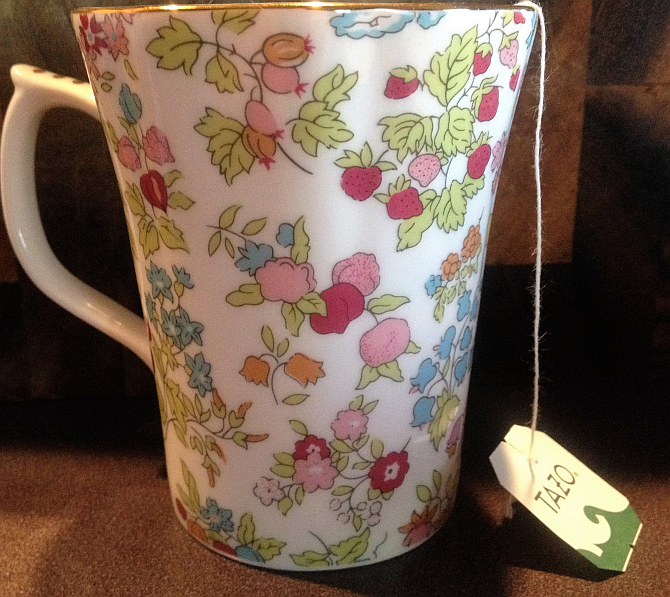 Look for TAZO Organic Peachy Green Tea in your local grocery store or Target. You can also find it on Amazon: TAZO Organic Peachy Green Tea. It’s now joined the ranks of TAZO’s Passion, Sweet Wild Orange, Zen Green Tea, and Chai Tea Concentrate on my trips to Target… If TAZO keeps this up, I’m going to need two carts.